PHILADELPHIA – Pennsylvania Gov. Tom Corbett, a right-wing Republican, took office in 2011. Each year since then, Corbett and his Republican-dominated legislature have reduced state funding for more than 85 percent of Pennsylvania’s school districts. The cities have taken the biggest hit. 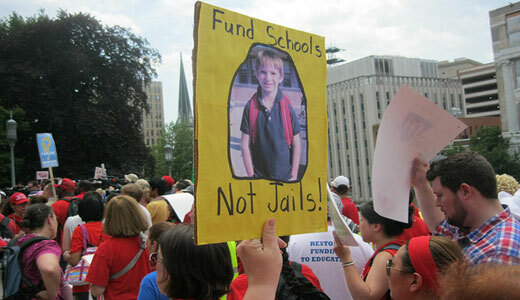 The governor and legislature have also tried to push through a complex of public school privatization schemes. So far they have not succeeded in doing so. But the continuing cuts in education funding increase the crisis the schools have been forced into, and gives hope to private foundations and investors as they plan their next moves to grab hold of public schools for their own purposes. Philadelphia’s families, teachers unions and other school worker unions as well as students have responded with a rousing “Hell no, our schools are not for sale.” With skill and a savvy eye, organizations have taken the fight for public education to the seat of power in Philadelphia – the School Reform Commission, the mayor’s office, and the City Council – as well as to the state Capitol and into the streets, with colorful demonstrations dominated by the young generation. Media Mobilizing is one of the organizations involved. Founded in earlier social justice and anti-poverty struggles, Media Mobilizing uses media, education and organizing to build the growing movement to end poverty. Housed in the West Philadelphia neighborhood, the organization attracts artists, poets, musicians, journalists, filmmakers and others seeking to connect their talent with a movement for social justice – where the rubber meets the road.